Saturday I made a morning trip to my old neighborhood in Waltham and spent close to two hours eating, tasting, and soaking up the amazing vibe at one of my absolute favorite food vendors in New England: Moody's Delicatessen and Provisions on Moody Street in Waltham. 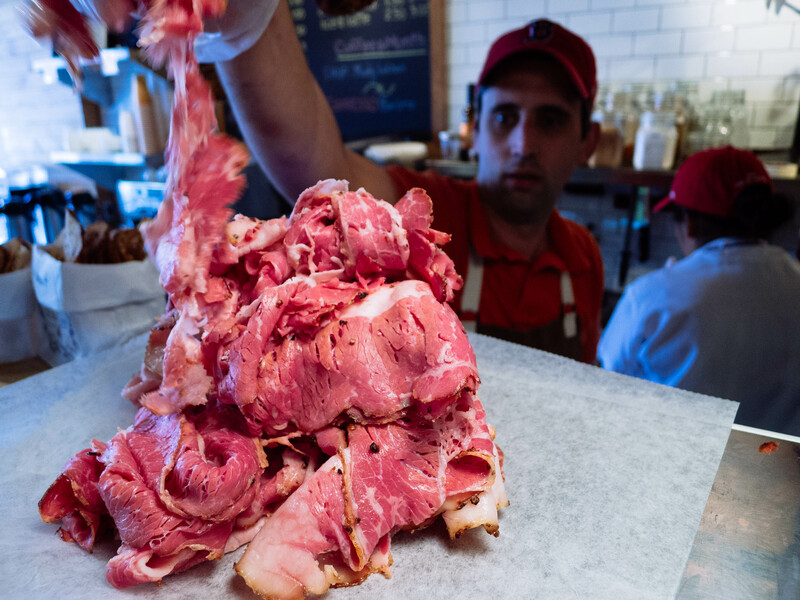 Like every good deli in New England, Moody's is jammed every Saturday with hungry people loading up on fresh-made deli sandwiches and sandwich supplies for later in the week. 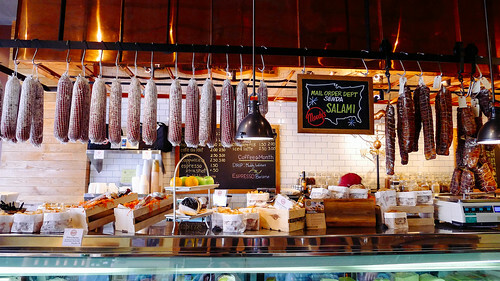 But inside Moody's you won't find the standard New England deli case loaded with plastic-wrapped Boar's Head cold cuts. 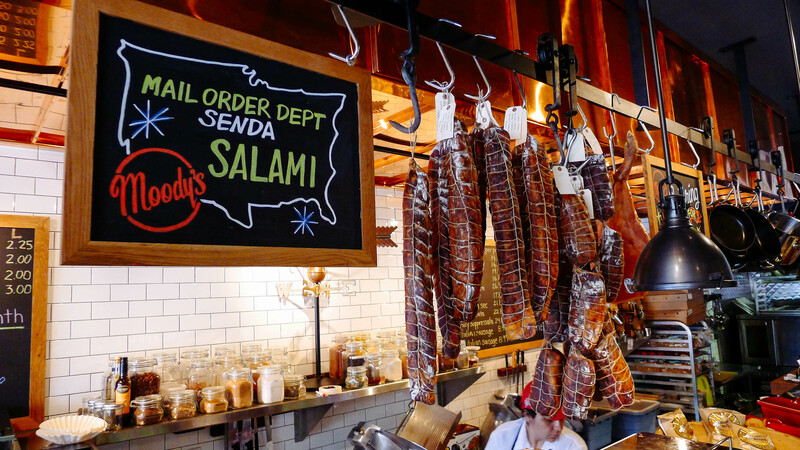 Instead, you'll find over a dozen different cured meats, from truffle salami to dried Spanish-style chorizo seco to absolutely killer coppa. And at least half a dozen varieties of house made and cured sausage. And so much more. 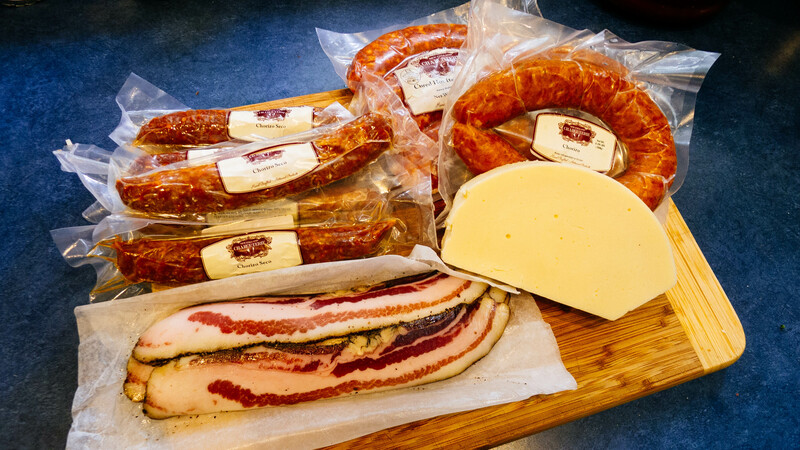 All made and cured on the premises. It's cured pork heaven in New England. By noon on Saturday, Moody's was jammed, with a line of people waiting to order nearly out the door. But they open their doors at 7am, so you can stop in early, get a breakfast burrito with spicy sausage, chat with owner Joshua Smith, and beat the lunch rush. I brought home a half pound of house cured pancetta, and made two giant bowls of panzanella (one with turkey bacon). This great recipe from Food 52 hit my inbox this week, so I've been craving a summer tomato salad with bread and bacon. I've been using Alton Brown's recipe for years—the best solution ever to a BLT craving. That gorgeous pastrami will make its way into some lunch sandwiches this week, and I also picked up some "Waltham style" pork roll. In the Mid-Atlantic where I grew up, this processed is usually fried up and served with brunch, or on soft white bread with mayo. It's not the fanciest pork product, but Joshua Smith described how he uses Berkshire pork and maple syrup to do his pork roll, and I had to try it. My friend Crash is a native of Kennett Square PA, AKA Mushroom City USA, and always lists pork roll sandwiches as one of his favorite Philly foods. I'm hoping we can fry up some pork roll together this week so he can show me how a Philly boy does it. 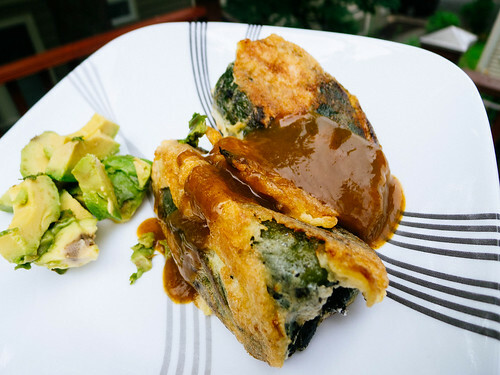 I ended up using some of the pork roll to fill some Sunday morning chiles rellenos. Rick Bayless' classic recipe presented nicely here by the Paupered Chef describes an elaborate process stewing a filling with pork, tomato, and spices. But I cheated and crisped up some pork roll and added it to my usual filling: smoked cheddar cheese. The flavor of the pork roll worked great with the roasted peppers and smoked cheese. I'd love to try a more elaborate picadillo with a pork roll base. Maybe next weekend.